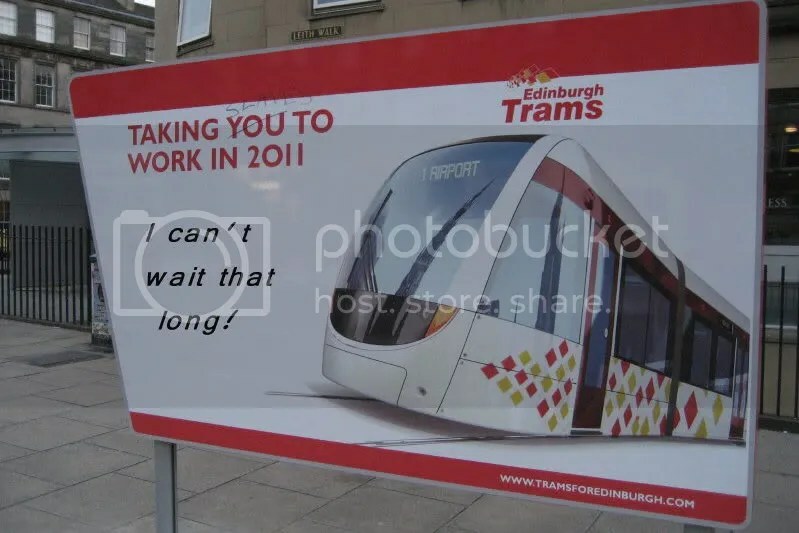 You know, really the worst thing about the chaos on the streets is that while Edinburgh Council claim “A high-quality, modern and efficient tram network is being created for Edinburgh and is scheduled to be running on the Capital’s streets by 2011” – I haven’t met anyone who actually believes that. Edinburgh City Council (any political incarnation) has never been known for its efficiency in solving traffic problems (anyone else remember the reorganisation of Charlotte Square that placed two sets of traffic lights so that the 41 bus was pretty much guaranteed to take an hour from the Queensferry Street entrance to the George Street exit?) and all the 2011 date means is that we certainly won’t have even one tram line running until then. There may be a Leith Champion to “encourage trade back to Leith, as well as ensuring the remaining tram work is completed as efficiently as possible” – but it’s kind of late in the day to think of that, isn’t it? Businesses are closing down already because no one can get to them, and to date it hasn’t even occurred to the council to offer to subsidise the banners some businesses have paid for to tell customers they’re still open. If you need further proof then your article “Champion to rescue Leith from tram chaos” demonstrates that the cost far outstrips the benefits. It states that Leith has been hit the hardest. Why? Because that is where all of the effort is currently. Princes Street will suffer even more when it is subjected to closures later on this year. Will we be seeing a champion for Princes Street? How much pain are the people of Edinburgh going to suffer from this project, how much is it costing in real terms?